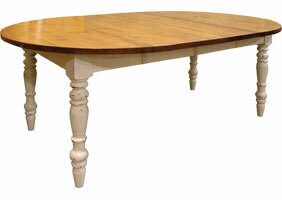 The 48" Round Turned Leg Table with extensions. This table comes with two 15" center extensions that extend the table to 78" long. The legs are turned and available in a 4" width and 5" width. 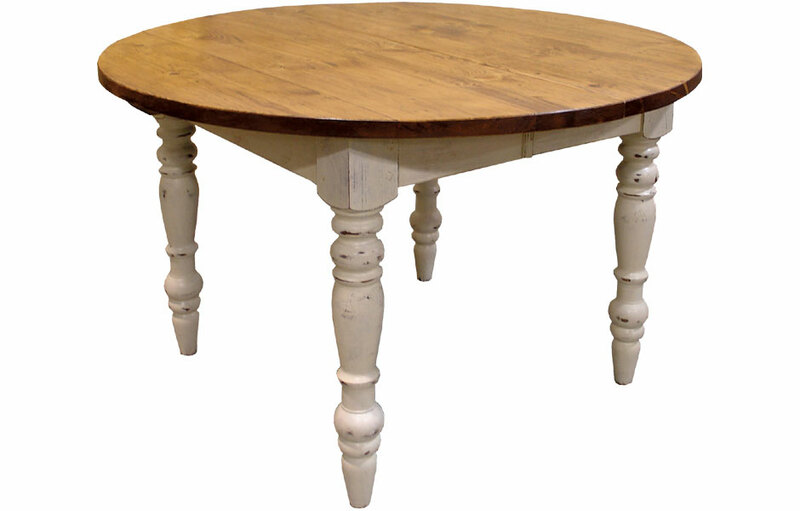 This 48" Round Turned Leg Dining Table with (2) leaves is the perfect size for a family of four. When guests arrive the table can be extended to an oval with the (2) 15" extensions to seat 6 to 10 guest. 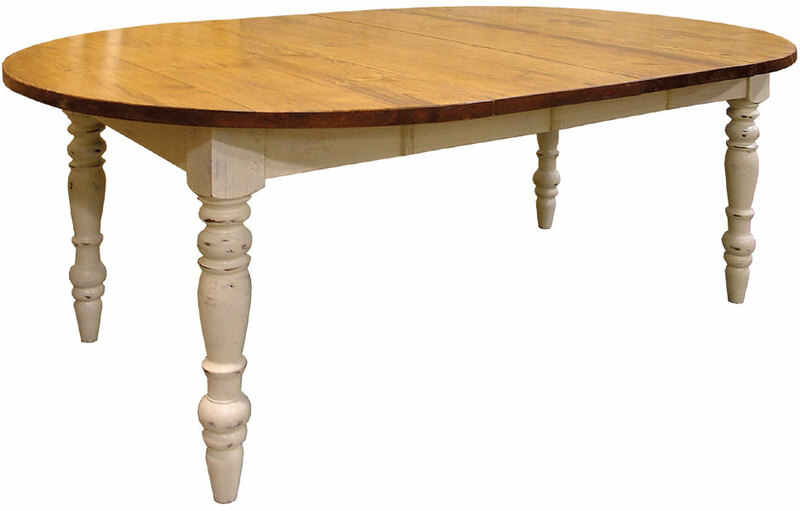 This round table is a great kitchen table, or a grand oval dining room table when the leaves are in. 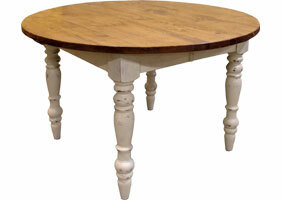 The extending round dining table's turned legs and French country styling makes it elegant enough for a dining room. The solid wood top is designed for daily use — it's water-sealed and waxed to prevent water-rings. The top is easy soap and water clean-up. The Round Table can be built with 4" turned legs for a modern farmhouse style, or with a 5" turned for a heavy leg, rustic feel. The classic lines of this dining table make it a versatile choice for traditional, contemporary, farmhouse, and rustic home depending on the paint and stain finish chosen. The Round Extension Dining Table has a 1 1/4" thick top with a variety of top styles; "Stained Pine" new pine wood, "Vintage Wood" reclaimed barnwood tops, "Hand-Planed" new pine planed and distressed, and "Birch" solid hardwood. The table base can be painted and/or stained in a color of your choice. The 4ft. 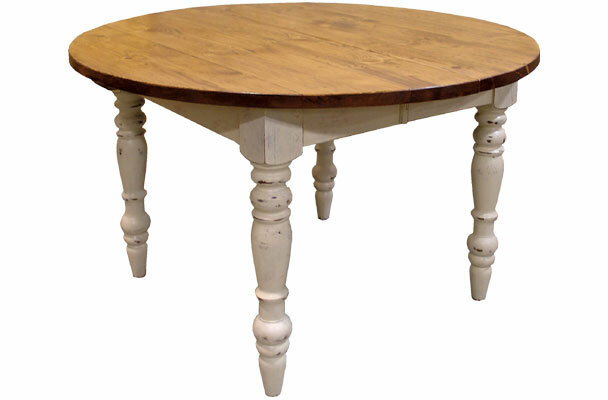 round dining table can be finished in our classic French country two-tone finish, or stained and painted all-over one color.